Stay up to date with the latest gear and gadgets for life on the road. 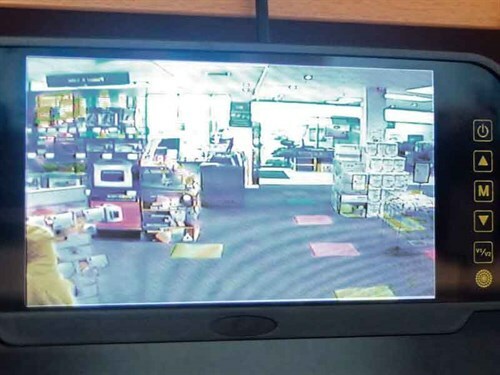 In MCD's latest technology feature, we take a look at rear-view cameras. Recently, our beloved Passat came off second best after a night-time encounter with a carpark power pole. Had it been fitted with a functioning reversing camera and monitor, the Passat would probably have remained unscathed. Having a fully functioning reversing camera on an RV reduces stress and improves driving safety when reversing. The driver can see obstacles to be avoided, be they toddlers, lampposts, or other motor vehicles. While not compulsory for RVs, it is a darn good idea to have one fitted no matter how young or old your RV is. 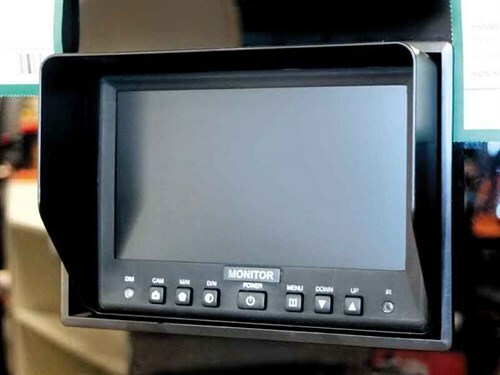 Here are some important things to look for when buying a reversing camera system. Monitors today are LCD and those offering the best picture use thin-film technology (TFT). Sizes range from four inches (100mm) through to 10 inches (250mm). If you already have a screen in or on the dashboard and it has an auxiliary input, buying a compatible camera/cable may save you having to buy a new monitor. If you do have to buy, monitors with hoods that keep the sun off the screen are best for dashboard mounting. Image sensor size and type and the focal length of the lens determine this. The larger the sensor, the wider the field of view. A 6mm sensor may stretch to a 90-degree field of view compared with a 120-degree for an 8mm sensor. The bigger sensor also provides better picture quality, especially in low light. For the reversing function, opt for a field of view of 120 degrees as a minimum, 150 degrees as optimum, and 180 degrees as maximum. Wider than 180 degrees can be distorted and difficult to use. Note: The human eye field of view is around 114–130 degrees. Side by side in a single mount, the wide-angle camera provides the image when reversing, while the other camera shows the rear-view image. Fitted with a 50- to 80-degree lens, the second camera provides a better picture of what is happening 100 metres down the road. The monitor must accept two input feeds, one from each camera. Two types of sensors are used in reversing cameras—CCD (Charge-coupled Device and CMOS (Complementary Metal-oxide Semiconductor). CCD sensors, because they are more sensitive to light and perform well in low light situations, have been the preferred sensors. CMOS sensors, being cheaper to manufacture, have been refined over the years and now have a similar performance to CCD sensors. Either should do the job. Cameras are mounted in three different ways—surface, flush, or licence plate. 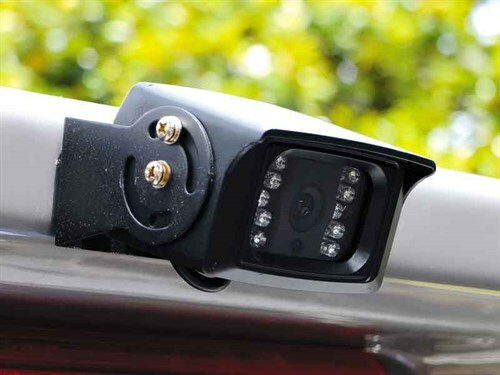 In general terms, licence plate and flush mounted cameras suit cars, while surface mounts suit motorhomes and caravans, allowing the cameras to be mounted high up on the rear of the vehicle. The image we see in the rear-view mirror is the image we expect to see on the monitor. The camera image is taken looking aft and if displayed that way on the monitor would appear to viewers to be back to front. Most reversing camera monitors display a mirror image just like the image on the rear-view mirror. If it doesn’t, don’t buy it. Having a camera fitted with a microphone has definite advantages especially when used on a caravan. Assistants can provide verbal advice even when out of the driver’s sight. Buy a camera that has infrared low light vision capability. This allows the driver to see six to nine metres from the camera­—enough to keep out of trouble. Lens fogging can be an issue in the winter. Ask if cameras with auto demist/defrost are available. 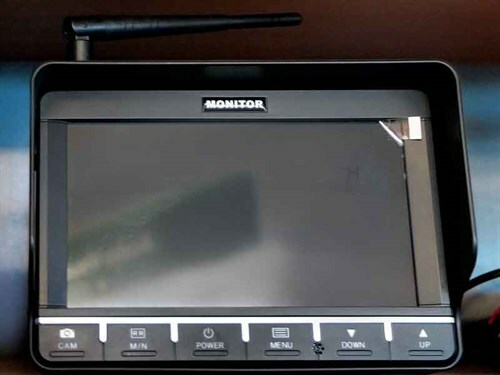 Wireless systems have a transmitter in the camera and a receiver in the monitor ‘connecting’ the camera to the monitor. Wireless is easier to install but prone to interference from other wirelessly controlled devices. Interference causes annoying stripes on the monitor screen. Digital wireless avoids interference to a degree but as device numbers increase, it may not in the future. Wired is reliable but is laborious and/or expensive to install. Connecting the reversing camera power circuit to the reverse lights circuit of the motorhome or tow car ensures the system is active when the vehicle reverses. This is a desirable option to have except if you have fitted a twin camera that has the second camera working full-time providing a rear view in lieu of a rear-view mirror. In this case, the system should be wired to activate when the ignition is turned on. Make sure the reverse system voltage matches the vehicle voltage. Units accepting variable voltage (say 12- to 18-volt) will be more durable. Otherwise, consider fitting a voltage regulator to protect the equipment against current surges. The camera, wiring, and connectors will suffer from exposure to the elements and need to be appropriate for the conditions. The camera must be weatherproof, the wiring UV-resistant, and the wiring connectors watertight. Most popular brands should tick all these boxes but it doesn’t hurt to check them out thoroughly, just to be sure.